Our agency now offers tax assistance to eligible indivduals and families in our seven county service area through the IRS Volunteer Income Tax Assistance Program (VITA) by offerring free tax help for taxpayers who qualify. We have trained community volunteers and offer free tax preparation assistance and free electronic filing (e-filing). Individuals taking advantage of the e-file program will receive their refunds in half the time compared to returns filed on paper – even faster when tax refunds are deposited directly into one's bank account. Contact the office nearest you to schedule an appointment today! 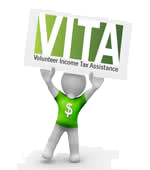 If you are interested in volunteering your time in preparing tax returns for the VITA program, please click here to get a copy of our Volunteer appilcation to fax to (251) 626-2613.